I don’t know if y’all remember my Persistence Sweater (the green one with cabled sleeves) from this summer, but I made it based on a pattern from Ann Budd’s The Knitter’s Handy Book of Top-Down Sweaters. It’s a super cool book if you’re interested in designing your own sweaters, but still want someone to hold your hand a little bit while you do it. The book is based on the idea of constructing a sweater, starting by casting on at the neck and working your way down the body and arms. This allows you to try on your sweater as you go, to see how it’s fitting, and if you need to change anything while you work. It’s really great, especially if you are a self-doubting, frogging and reknitting knitter like me. She includes a few complete patterns for sweaters which are pretty, simple, and classic with interesting little details. But, the golden part of this book are the tables. The glorious, glorious tables! I know I’m a bit of a data geek, but, come on. They’re amazing. Pages and pages of really comprehensive, and totally useful tables. She includes basic outlines on how to do four different shoulder styles, as well as instructions on how to do several different necklines, cardigans and pull-over variations, long sleeves, and short. And everything is written for 15 sizes and at 5 different gauges (that’s where the tables come in-she’s done all the math for you already!). So, basically she lets you pick out your design elements from her buffet of knitterly goodness, add in a few decorative touches of your own, and before you know it, you’ll have a one-of a kind, custom-designed, hand-knit sweater. Amazing! Of course, if you’re a brand-new knitter, the charts and tables might be a bit intimidating, but this book is seriously worth taking a look at. (Also, it’s quite a big book, because of all the great tables, so it might be a “knitting at home” project, instead of a traveling one.) If you have a sweater swimming around in your head that you haven’t found a pattern for, give this book a shot, it might be just what you’re looking for. 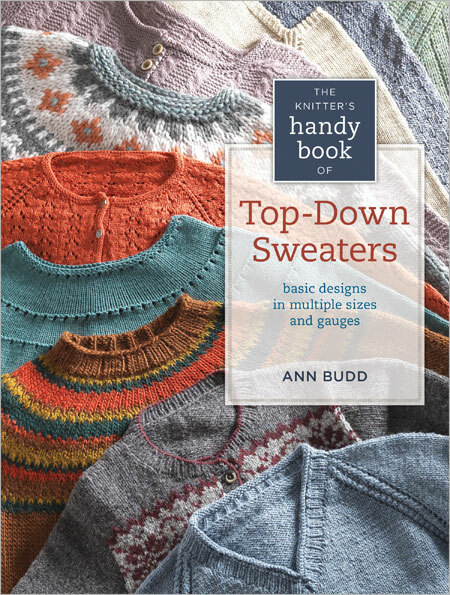 This entry was posted in Pattern Spotlight and tagged ann bud, designing patterns, knitter's handy book of top-down sweaters, pattern book, sweater, top-down on November 27, 2013 by onemilljellybeans.